ZippyApp is the simplest way to apply for jobs at participating businesses. There is no need to download a mobile app. Just use any QR scanner and scan the QR code provided by the employer. Scanning the QR code directs you to the employers hiring page where they have listed all their positions. The system is optimized to run natively in any browser including mobile. So it automatically detects the device you are on and optimizes viewing for that device. Once you scan the QR code and are on the hiring page of the business, take a moment to review the information about the business. Review the list of jobs and select Apply to submit your application or share that job with your friends. Follow the instructions once you have selected the option. If you have a ZippyApp account and are redirected to login then just login and continue. 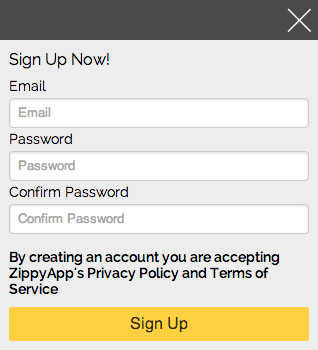 If you do not have a ZippyApp account, then create an account and fill out the common employment application. Add your resume and even a cover letter – you are ready to apply with just a few clicks on any device including your smart phone. You can start the process on your mobile device and complete it on your tablet or laptop. You can go back and forth between devices. Please read and follow these instructions to ensure your application is completed properly and is submitted for considerations. 1. Just go to ZippyApp.com and sign up under "Job Applicants". You'll be asked for an email and a password as well as password confirmation. 2. You will then receive email verification with a confirmation link. You MUST click on the link provided in the email to activate your account. 3. 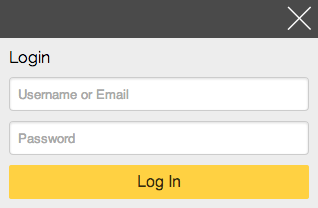 Proceed to login by providing your email address and the password you selected. 4. 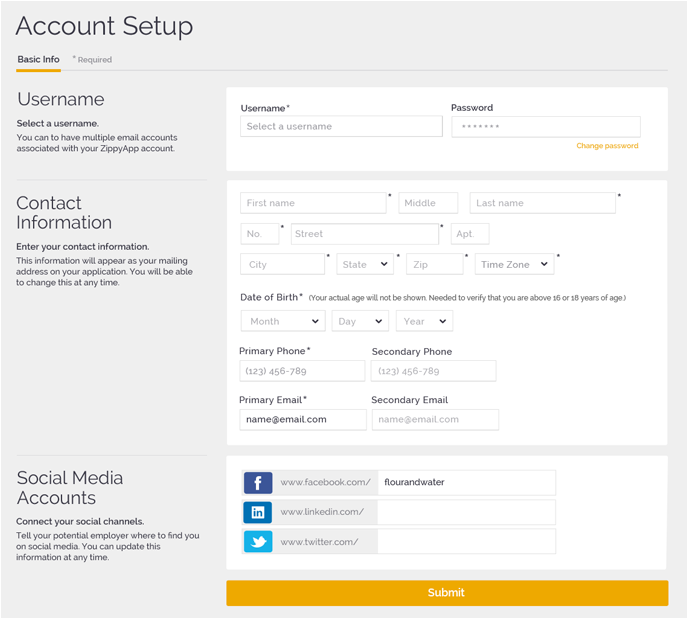 Once you login, you are directed to the "Account Setup" page. Select a user name and fill out all of the information. This information is used to populate some section of the employment application. 5. Hit submit at the bottom of the page to save the information. Now that you have created an account, proceed to completing your profile by filling out your employment application and adding your resume and cover letter. One important point to keep in mind is that this is your Master Profile. When it is time to submit your application for every job, you have the option of editing your application for each submission as well as updating your Master Resume and Master Cover Letter in your Profile. 1. From your dashboard select "Profile"
2. Review the "Basic Information" section and complete the section. 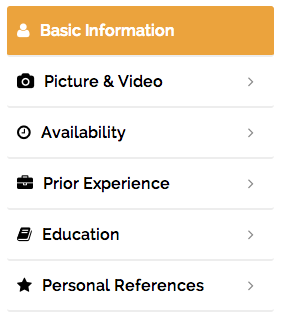 You can access each section of the application by clicking on the list on the left at any time. However, it is best to follow the flow. Fill out each application section and hit Next to move to save and move to the next section. 3. Hit "Next: Picture & Video" to save and move to the next section. 4. Add your picture and a link to a video if you have one. Otherwise , leave it a blank. 5. Hit "Next: Availability" to save and move to the next section. 6. Select your availability form the drop down menus and fill in the information accordingly. If there are any comments, feel free to add it to the "Additional Information" of the "Availability" section. 7. Hit "Next: Experience" to save and move to the next section. 8. On the Experience section, fill out your most recent experience and add more by clicking on the "Add Experience" button at the bottom. Once you have completed adding all your experiences click "Next: Education" at the bottom. 9. Similarly fill out the Education section. Just as in the Experience section, you can add "Education" items. Click "Next: References" at the bottom. 10. Similarly fill out the References section. Just as in the Experience and Education sections, you can add "Reference" items. Click "Finish" at the bottom. 11. 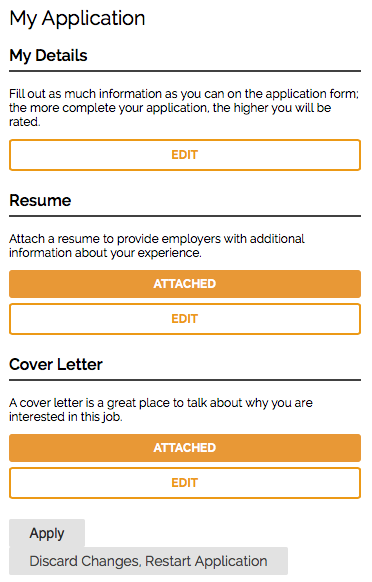 Now that you are done with the Application, select the Resume tab on the to right corner of the screen. 12. Simply cut and paste your resume in the space provided. You might need to do some formatting for better viewing. Again keep in mind, this is your Master Resume and you can edit it prior to submitting for each job. Make sure you click "Save" to save your Master Resume. 13. Now that you are done with the Resume, select the Cover Letter tab on the to right corner of the screen. 14. Just as in resume section, simply cut and paste your Cover Letter or simply type on in the space provided. Again keep in mind, this is your Master Cover Letter and you can edit it prior to submitting for each job. Make sure you click "Save" to save your Master Cover Letter. Your Master Profile is now saved and you can review the sections for completeness and accuracy. Make updates as necessary and save your changes. Now that you have an account and a complete profile you are ready to apply. It does not get easier than this now. Simply scan the QR code select the job and hit Apply. You are directed to the Apply Screen like the following. This is the way it looks on a mobile device, it looks slightly different on a tablet or full browser in a laptop. You now have the option of editing each section. Any edits you make at this stage are for this single submission. These edits do not affect your Master Profile. By default, your Master Resume and Master Cover Letter are attached to the application package being submitted. That is, if you have created them; they will be blank and not displayed if you have not created one. By clicking on the "Attached" button it will be changed to "Attach" and you have effectively removed that item from the package being submitted for the given job. Both, Resume and Cover Letter work the same way. By hitting "Apply" you will submit your application package. If you navigate away form this page, your Application Package will be in the "In Progress" state and you can submit it later. You can also Discard Changes and restart the application again. By clicking on the "Submission" tab on the main Navigation Tab, you can view all your previous application submissions. By clicking on the "Positions" title you'll be able to review the package that you submitted. This is very helpful for following up with the hiring organization. Follow-ups greatly improve your chances of getting the job. So don't forget this section and visit often.